Inspired by the beauty and mystique of the rainforest, Jambu footwear is designed to guide you in style and comfort on your next personal journey-at home or across the globe. Durability and comfort are just two principles Jambu strives for with every shoe they design. Let Jambu join you as you zip line through the rainforest, stroll the beach, navigate the city, or travel the world. 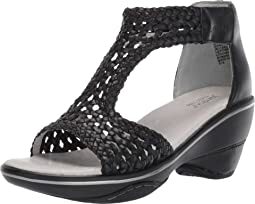 With so many silhouettes, spanning from shoes to boots, heels to sandals, Jambu has you covered. Be you with Jambu! Doing their part for the environment, Jambu uses only 100% recycled, recyclable and re-usable packaging. Whether it is shoes, boots, heels, wedges, mules or sandals, Jambu outsoles are made with partially recycled and re-usable compressed rubber. In this small way, Jambu hopes to preserve our great outdoors for future generations. Renew with Jambu! I enjoy having nice looking very comfortable casual shoes. Good tread and grip on the sole. And they last! I love everything about these shoes except where they rub my ankles. The suede is soft and supple, so I don't think breaking them in will improve the strap/ankle relationship. Returning these but already loving a kindred pair of Jambus that respect my ankles' personal space thanks to Zappos. These shoes are so unique I think I'll keep them even though they are not as comfortable as I'd like. The issues I have are: not enough support for my high arches (and no way to fit an orthotic), a bit narrow where the foot needs width, and a little bit of rubbing at the top of the heel (I can fix this problem). I was hoping to wear these a lot on an upcoming trip. Instead, I'll just wear them around town. They are just so cute! One other issue to note: they arrived with a couple of scratches on the shiny part of the sole. Not a deal-breaker for me, but it seemed worth noting. These shoes are very well made and super comfortable. They are stylish and fun, too. Very cute. Fit perfectly. Read previous reviews and ordered half size smaller. Glad I did. True to width and size. Comfortable and easy to be on your feet all day in them. Moderate arch support. Easy as they required almost no break in period. I'm not quite sure if I'm keeping these or not. They're kind of cute in person, but not as comfortable as my other Jambus. The sizing is a bit weird, as they're tight in the toebox, but very loose in the heel to the point where I'm a little worried about blisters. The cutout detail is nice, and the style is versatile enough to look good with skinny jeans, skirts, or dresses. Overall they're nice, but the usual Jambu comfort just isn't there. I wear a 9 and returned these for a 9.5 which was still too short. I’m going to try a 10. If I get them to fit, I feel like they’ll be a good walking shoe with moderate to great arch support. Really happy with the fit and comfort of these Jambu shoes. 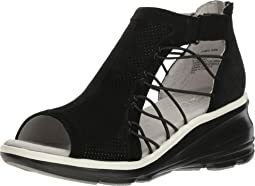 I wear a 10N and sometimes the Jambu shoes with Velcro straps don't allow me to tighten as much as I need, but these have a lot of range with the Velcro. I have worn these shoes for about a week now, and they are very comfortable and cute. These are the most comfortable shoes that I have had for a long time. They were recommended by a friend and she was so correct. Going to buy other colors in other Janbu styles. I usually take a 7 to 7.5 in shoes because of a wide toe box but I have found 6.5 in Jambu open toes I take a 6.5. Comfortable out of the box. I have 5 pairs of Jambu Sugar(no longer available) took a chance on Sandy since they appear to be built on the same platform. So far so good the adjustable velcro strap is a great addition! Soooo comfortable!!! And so cute!! Cute shoe but toe box was too shallow. 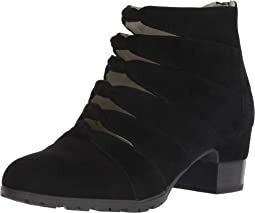 I love these shoes - I wanted something for casual days at the office and weekend that had support. These fit the bill! 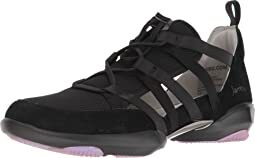 I have wide feet and they accommodate nicely, broke them in quickly the first day, wide toe box, and nice heel support. The sole really does absorb shock when walking. They remind me of what Clarks shoes used to be 10-15 years ago. Will be ordering more! ordered the size 9 because I was afraid they would run too small. Had to return the 9 for an 8.5 and they seem to fit fine. Nice arch support, ordered the wide and the width fits perfectly. Going to walk around in them for awhile to make sure they do not aggrivate my sensitive big toe. Very pretty red shoe! This shoe is amazing. Incredibly comfortable and cute too. Whenever I wear these, I get stopped by strangers asking me where I got them! I like them so much, I bought a second pair. The shoes are very comfortable. I have high arches and need support. I do not have to add any to these shoes. Love that they came within 24 hours and I could wear them the next night to an event. I really like how these feel. Almost like being barefoot. I had to put my arch support insoles in for added cushion but I have planter fasciitis. These will be a great walking shoe for summer as they are breathable and light. I really wanted to like these shoes but the opening of the shoes comes up too high and rubs on the bottom of the ankle bone nub that sticks out. No amount of breaking in would solve this. I would like these shoes if they had a lower cut opening. Excellent shoe for the summer. 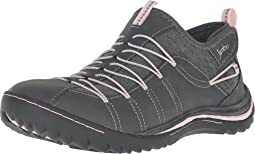 Not all Jambu shoes fit me well, but this one is the perfect arch supported cute leather mary jane shoe that I can walk in for hours. Keeps my feet cool and supported even thoug I live in the desert. I've added removable inserts to absorb sweat and be able to wash them. Love these cute practical shoes and I know they will last. 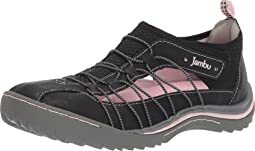 I had one pair of Jambu's that lasted me for 5 years, including various travels all the way to Nepal. I have purchased many different shoes from this company over the last 10 years because they fit my foot well. Medium size 8/38. 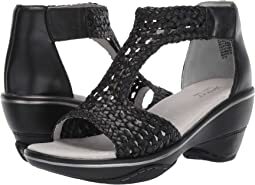 This style has moderate arch support, but also more flexible, compared to some of their other shoes which are a more supportive that I use for work. I picked them to be more flexible for light intensity kinds of activities. Comfortable for a neighborhood walk on pavement, grass, and pebbles/sand, or a lighter hike on more even and firm ground. I wouldn't wear them on an rocky or muddy or steep terrain hike. I have worn them with tennis socks and full thickness hiking socks, and that just determines how tight/supportive they will feel for the activity. Stylish and comfortable, lightweight. Happy to get a vegan product. They are shoes I will wear a lot for non-work activities. I can't believe I'm sending them back! They look like perfection! Size 9,5 was small. Size 10 was just right. But when I started to walk I've got a problem - back was moving every step. If I didn't try size 9,5 first I would think that moving is because it's too big for me. It looks like back of the shoe doesn't have that right curve, it's more like straight with little cushion inside. Great fit & quality- love them! I got these shoes in blue to go wit blue jeans. They were so comfortable, that I ordered the taupe, too. I’m thinking about the black...... I have a large bunion on my right foot, but the open design of these shoes make the bunion barely noticeable. I also like the hook and loop closures so I don’t have to mess with shoe laces. Very stylish and very comfortable. What more could I ask for? !